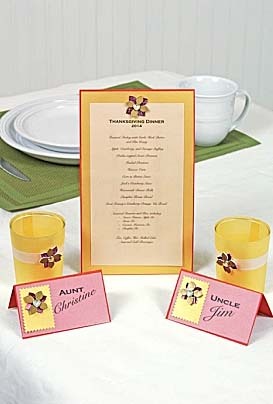 Project Description: Enjoy Thanksgiving in affordable style with Grafix Vellum and Shrink Film. Follow manufacturer’s instructions to shrink film. (Note: If using oven, try inserting die-cut film into parchment paper pouch to keep plastic from twisting.) Let cool. Layer gold film on top of the magenta film, punch a hole in the center and slide onto brad stem. Repeat for all embellishments. Print menu on inkjet vellum; trim to desired size. Mat with Gold vellum; adhere to Canyon Clay cardstock base. Punch a hole at top center of the menu; insert embellished brad. Adhere to secure. Print names on inkjet vellum; trim. Die cut Patch from Gold vellum; adhere to the left of the name. Punch a hole at top center of the patch; insert embellished brad and bend ends on the back. Adhere to secure. Create top-fold base from Canyon Clay cardstock. Adhere name panel to base.